It takes a while to adjust to any new role. Six months into being an Assembly Member I must confess that while there are elements that fire my enthusiasm, there are elements that make me tear my hair out. The most satisfying part is representing the area where I was born and raised in our National Assembly: It’s a huge privilege, and a huge challenge too. I’ve made a good start on the things I promised to do, like an economic strategy for Llanelli and creating a litter taskforce to clean up our streets. I’ve also spoken up on issues in the Assembly, challenging traditional thinking. I set out to be a fresh voice for Llanelli, and I hope my first six months has shown that I’m not afraid to speak out on the issues I care about. Of course, there’s a balance to be struck between reflecting public feeling and being true to your principles. For me politics is about making an argument about changing society, not simply parroting what the latest opinion poll says. I’ve been encouraged so far that many people accept that I will sometimes hold opinions they don’t agree with, but they appreciate honesty and integrity. One of the challenges of being an AM is finding the time to think and reflect; And to balance the role with the needs of my family. Like countless families across the Llanelli constituency my wife and I struggle with juggling the needs of our children and the pressures of work. Picking up and dropping off the kids is a challenge for us. My wife works for the NHS in Abercynon, and I need to be in the Senedd in Cardiff Bay four days a week, and active throughout the constituency on other days. I also am hyper-accessible through social media and via my busy office in the town. I hold a joint surgery with Nia Griffith MP every Friday between 10 -11 at Lakefield Hall in Llanelli where you are welcome to come to speak wth me to discuss any issue you may have. As I expected, the role is full-on. But I’m keenly aware our family life can’t be just about managing my demands. My wife is a professional in her own right, and my two children deserve the time and support of us both. They need stability in their young lives and that is why, instead of uprooting our children from their schools and friends, we’ve made the decision that I move around instead. 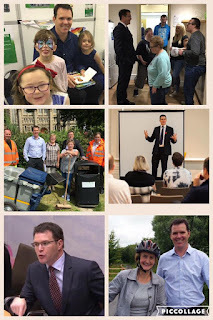 I split my time between Cardiff and Llanelli - where I have a family home which I stay in several times most weeks, enabling me to be busy and active working in the community. I have got lots of plans for things I want to do and issues I want to raise over the next five years to improve our constituency. But I also want to be a good father to my two young kids, and a good husband. It’s a challenge for sure, but also an opportunity to make a difference that I don’t intend to waste. And when its all over I want to be able to look myself in the mirror, and look my family in the eye, and have no regrets.